Yesterday, Diagon Alley opened its gates at Universal Studios Florida for the massive amounts of people waiting to get a glimpse of the new area. Universal Studios Florida had a grand opening ceremony to welcome guests to the new immersive land from the famous author JK Rowling. This area contains the new Olivanders Wand Shop, show and shop space, The Leaky Cauldron restaurant, and of course Gringotts Bank which has a fire breathing dragon on top of it. The bank holds this area’s only ride, Harry Potter and the Escape From Gringotts. This ride is a mixture of a rollercoaster and a 4D show. I had the chance to ride the new coaster yesterday and I have to say that there is not another ride quite like it anywhere else. Tilting tracks, spinning cars. 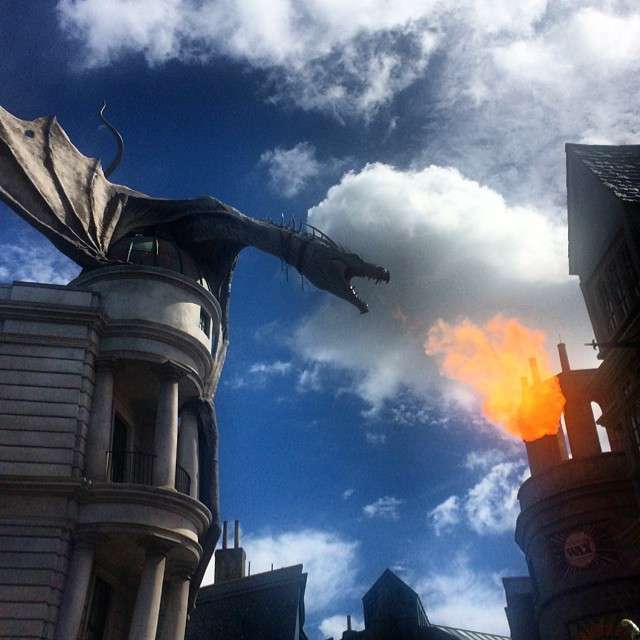 special effects with fog, smoke, and water, and the famed Potter cast make this a one of a kind attraction! Yesterday, the wait time hit a high time of 450 minutes (7 and a half hours) just for the attraction. I heard yesterday from a Team Member that the entire que stretches 2.5 miles, which was completely full yesterday. I got on the ride in a little over an hour yesterday, due to the fact that I was in the first wave of people into the park. I enjoyed the ride, and cannot wait to ride it again! Where you at opening ceremony yesterday? What did you think? Would you do it again if you had the chance? Comment below and let us know! Previous Post Busch Gardens Saves Bald Eagle On 4th of July!